Grand jury subpoena and FBI search lead LA school district to end iPad, Pearson contract. 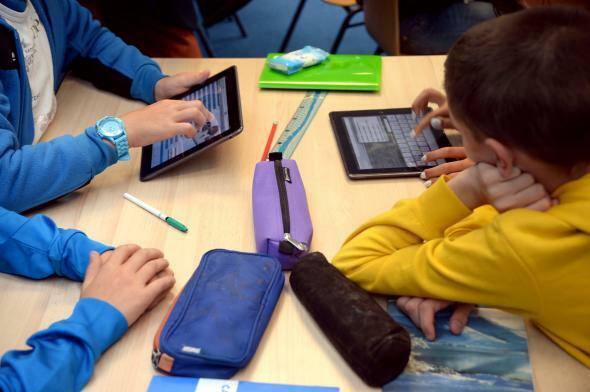 French students use iPads in a classroom. In June 2013, L.A. schools approved a contract to allow Apple and Pearson to provide iPads loaded with educational software to local classrooms. By October 2013, students were regularly hacking the tablets to play games and browse the Web. But in October 2014, L.A. schools superintendent John Deasy resigned amid accusations that he didn’t disclose close relationships with Apple and Pearson executives. As if things weren’t already looking bad for the $1.3 billion project, the FBI is now investigating it. As the Los Angeles Times reports, school officials gave 20 boxes’ worth of documents related to the iPad initiative to the FBI, per a grand jury subpoena. The investigation is mainly looking at talks and evaluations that went on before bidding started for the L.A. school district’s iPad contract. The subpoena calls for “score sheets; complete notepads, notebooks and binders; reports; contracts; agreements; consent forms; files; notices; agenda; meetings notes and minutes; instructions; accounting records” and other records. The investigation seems to be looking for inappropriate relationships and dealings that might have influenced the bidding process. “We’re not going to use the original iPad contract anymore,” said Ramon C. Cortines, the current school superintendent. “There have been too many innuendos, rumors, etc.” He says the plan to suspend the contract was agreed upon before the FBI search. The iPad program has been mired in controversy since its conception, with critics pointing out its huge cost and dubious contribution to daily learning. Before the 2014–2015 school year even began, Deasy had suspended the contract with Apple and Pearson to potentially redo the bidding process. Now it seems like the contract is really dead. Again. But for real this time.